Foraging : The kite will forage over open lands. Nesting : Generally <600m Red kites require trees for nesting, although the Cape Verde race of the red kite has reportedly been found to nest on cliffs occasionally. 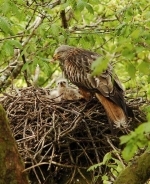 Nests : Red kites build large stick nests. Nests are lined with sheep’s wool. Nests are often decorated with fresh greenery or pieces of rubbish. Red Kites do not have strong habitat preferences. Over their European range they tend to avoid extremes of climate, hence they’re restricted distribution. Kites hunt over open landscapes. In many areas they are closely associated with farmland. The mixed landscape that man has created throughout much of Europe has greatly benefited the kite. An undulating landscape more readily provides thermals for the kites to soar on than a flat one. Locally kites may prefer rolling terrain or the foothills of mountains because of the thermals. Large areas of forest are generally avoided except for nesting or roosting in. Small copses can be utilised for hunting.